In order to support the planning application for the erection of 3o dwellings a desk study report was required to determine if the site had the potential to be impacted by elevated levels of contamination. Demeter Environmental were commissioned to prepare the desk study report n November 2014. The first stage was to review the site history using historical Ordnance Survey maps for the are as well as aerial plates and any streetview imagery. The O.S maps indicated the site comprised of open land with a pond on the northern boundary of the site (in-filled by 1912). A building was erected on the site circa 1932 on the north eastern access point and a large building was erected on the northern boundary by 1932. The O.S. maps revealed a number of parcels of potentially in-filled land within 250m (all of which were ponds), the aerial plates no not reveal any further changes to the site or surrounds. A review of the planning history of the site was undertaken and no salient information was sourced from the two previous applications. Data provided by Groundsure and the Environment Agency confirmed that here was no landfills within 250m pf the site and that the site had bee used for fish, meat and poultry products. 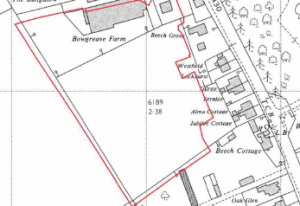 On completion of the desk based assessment a walkover survey was undertaken, which revealed the site to comprised of a dwelling, various agricultural buildings and field. A mound of made ground was identified on the field. A qualitative risk assessment was undertaken and it was concluded that that the on site sources (in-filled pond, mound, made ground and meat factory) posed a potential risk to the identified receptors. 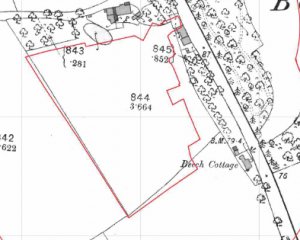 A Phase II investigation was proposed to determine the extent of any made ground on the site as well, if the site soils had been impacted by the meat works as well as the composition of the soils within the in-filled pond and mound. The desk study was submitted with an application to discharge conditions (15/00040/DIS) which was accepted. The Phase II investigation was undertaken in March 2017, which comprised of the excavation of a number of trial pits across the site as well as trial pits within the mound and in-filled pond. Additional samples were taken from the mound and in-filled pond to determine the gassing potential based on the guidance in the CL:AIRE Research Bulletin ‘A Pragmatic Approach to Ground Gas Risk Assessment’, which determined the materials within the ponds had the potential to generate ground gases. The assessment of the made ground indicated the made ground was impacted by low levels of organic contamination (PAH’s), it was concluded that the material should be removed form the proposed garden and landscaped areas (which was due to happen as part of the development). The assessment of the potential risks from ground gases indicated there were three options, remove the potential source of gassing, undertake ground gas monitoring or install gas protection measures in the dwellings. It was concluded that the mound would be removed as part of the site levelling and that the removal of the material in the in-filled pond was the cost effective solution. The Phase II report was submitted to the local authority in May 2017 (revised to clarify the remedial proposals) and was accepted.